Darwin is the youngest of four siblings. He grew up in a small town in the state of Chiapas, in southeastern Mexico. His father was an electrician, but he now dedicates his time to his small parchment coffee farm, on which he manages each stage of the coffee processing. Darwin’s mother is a homemaker. Despite his parents’ own basic level of education, both have encouraged their children’s studies. One older sister has a university degree, and Darwin’s other siblings have technical degrees. Darwin graduated in 2009 in strong academic standing from a technical high school, where he studied computer science. As a high school student, he demonstrated environmental leadership, helping a local organization to clean up parks, rivers and waterfall areas, together with a group from his school. In the months following graduation, he worked with a government program in a municipality within Chiapas located an hour and half from his home, teaching preschoolers to read. As he worked, he grew to admire the community’s organization and initiative in growing its own food. At the same time, Darwin gained a better understanding of the challenges they faced in harvesting their crops. Inspired to take action, he volunteered with the community garden there. 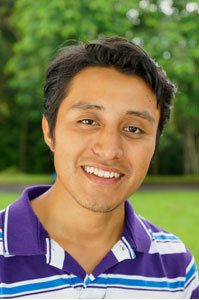 In his free time, Darwin enjoys traditional Mexican dancing, acting, playing the guitar, reading and playing sports. During vacation in April 2012, he and several friends bicycled the nearly 200 miles between the University’s Guácimo campus and EARTH-La Flor. He speaks Spanish, intermediate English, basic Portuguese and basic Tzeltal, an indigenous language. Since childhood, Darwin has helped his father care for the family’s land—checking plants’ maturity, monitoring the soil’s health and assisting in other ways. Now at EARTH, he appreciates the academic framework and practical skills he has gained to “produce, caring for the earth.” Hands-on activities in the field and laboratory, he says, have helped him to better understand the realities that farmers face. He also feels that his time at the University has taught him invaluable lessons about teamwork, solving problems and the importance of serving others. The University’s approach to sustainable animal husbandry—in particular, swine management and the use of bio-digesters—interests him greatly. He has seen the powerful way in which organic producers in his community have managed to reduce pollution, and he plans to contribute to their efforts when he returns after graduating. He also would like to help farmers connect more directly with markets and to increase communities’ capacity to sustain themselves. “I have the necessary tools to work with everything,” he says with gratitude.